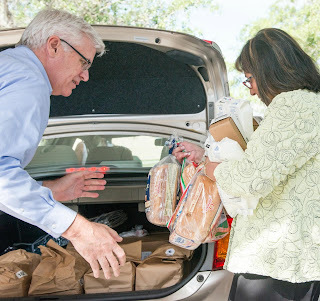 Hope Connections, a program of Hope Healthcare that provides at-home senior support, soon will be able to feed an additional 1,450 seniors in Hendry and Glades counties. Residents who are at least 60 and have a household income that meets federal poverty levels can enroll in the Florida Department of Agriculture and Consumer Services Commodity Supplemental Food Program during sign up events at Hope Connections, which serves as a local administering agency. 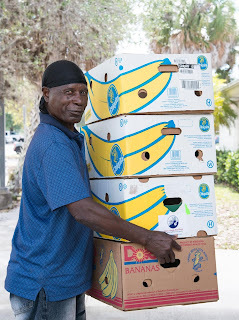 CSFP provides a monthly box of canned fruits and vegetables, juice, dry beans, rice, peanut butter, cereal and other food to eligible seniors so they don’t have to choose between eating or paying bills or buying medicine. Last year, Hope Connections provided more than 24,000 meals to underprivileged seniors in Hendry and Glades counties through home delivery and social meal centers. Harry Chapin Food Bank of Southwest Florida president and CEO, Richard LeBer and Samira K. Beckwith load a participant’s trunk with nutritious food.